Most collaborators get given the Illustrator file and proceed to hurl the entire Pantone book at the shoe until it begs for mercy. That's why most collaborations fail. ALIFE knew exactly what makes classic adidas models work, because rather than live their lives behind monitors the team has extensive real-world knowledge of sneaker culture in NYC. 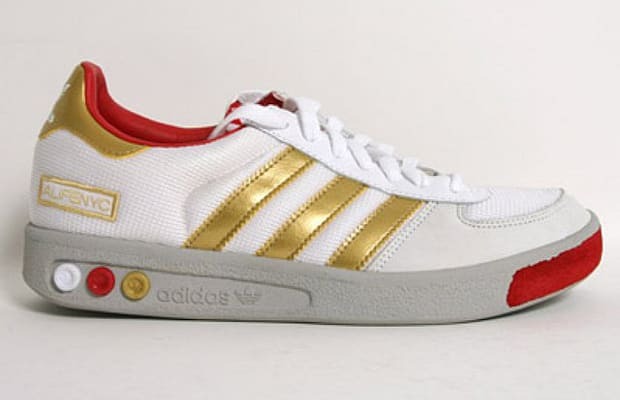 Part of a trio that included a Top Ten and a far bolder Metro Attitude, this Grand Slam makeup's white mesh, gold stripes and red lining was mirrored in those pegs on the midsole, bringing out the best in this court icon. This even got the nod from notoriously fickle European adidas fanatics, because it's a textbook display of restraint and expertise on the dual-label front. Future partners on sneaker projects should study this to see how a collaboration should be done.